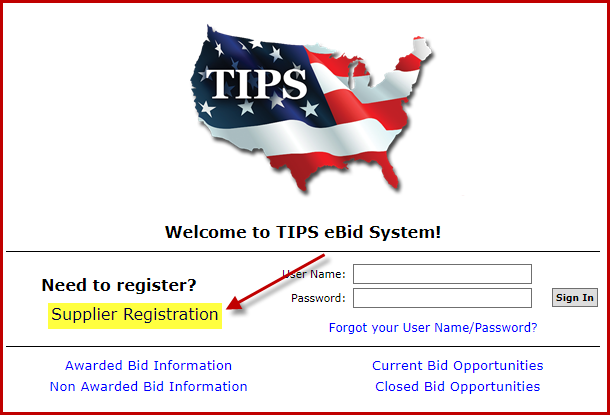 To be eligible to respond to solicitations (RFP’s/RFQ’s) posted by TIPS, your company must be registered in the TIPS electronic bidding system (shown below). Once registered, you will be notified of opening solicitations and can submit a proposal for an open solicitation that fits the products and services your company sells and provides. PLEASE NOTE: Simply registering is only the first step in the process to become a TIPS Awarded Vendor, and this does not make you eligible to represent your company as a TIPS Vendor. Please click here to review the entire process to become an awarded vendor.